Inspections, Testing, Repairs & Maintenance | Sentry Automatic Fire Protection Inc.
Fire sprinkler systems need to be inspected and tested regularly to ensure that they’re ready to immediately discharge in the event of a fire. Systems that don’t work properly endanger people’s lives and could inflict heavy and expensive damage to property. 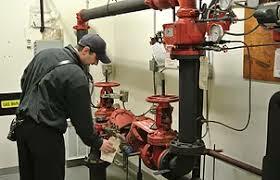 Our systems are inspected, tested, repaired and maintained in accordance with NFPA 25 as well as state and local laws.